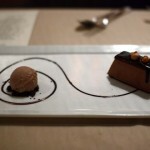 Like many in the D.C. area, Rachel and I have enjoyed wonderful meals at Rasika and its West End counterpart several times over the last few years. 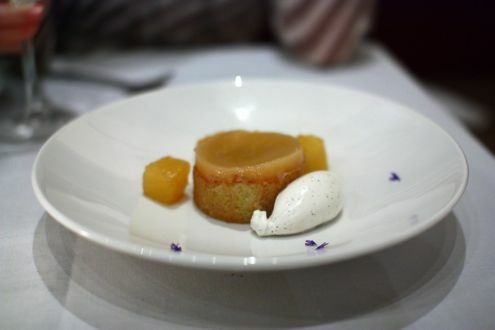 But when we were researching a Washington restaurant to celebrate our five-year anniversary that not only offered exquisite food but also didn’t break the bank (date nights now require a babysitter these days), chef Vikram Sunderam’s Penn Quarter establishment was a perfect match. Between the outstanding consistency from each prior visit as well as the countless dishes we still had yet to try from the menu, we felt that Rasika was an ideal destination. We started the evening off with some cocktails at the bar while waiting for our table. On top of that, we brought along a bottle of Dom Perignon Vintage 2000 that we received as a wedding gift five years ago. We felt that it was the ideal time to finally pop it open, plus the $25 corkage fee was rather reasonable and would pair up nicely with some of the dishes we would soon be having. Before we even ordered, our waitress poured us two complimentary glasses of sparking rose since they knew it was our wedding anniversary – a very nice touch! 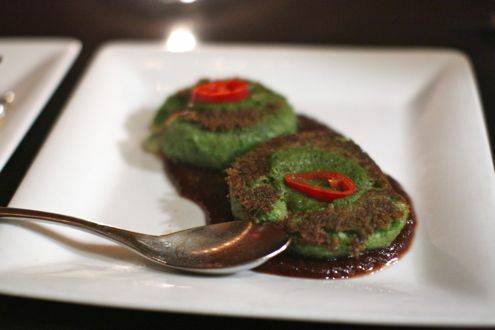 We kicked off with the Mattar Pudina Tikki – minced green peas shaped into two patties and blended with mint and mozzarella. This was only our first dish of the evening but even with that initial bite we could tell we were going to have a memorable, enjoyable dinner. 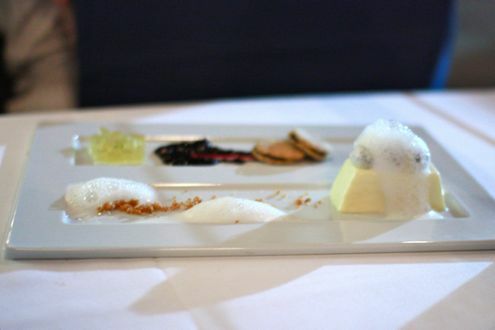 The combination of flavors works wonderfully yet you’re still able to distinguish all the ingredients with one forkful. Next was another popular dish, the mango shrimp. 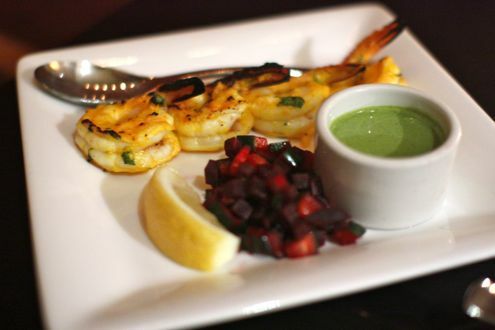 Perfectly cooked, the quartet of shrimp was prepared with fresh mango, cashews, ginger, and coriander while the mint chutney made for a great dipping sauce. 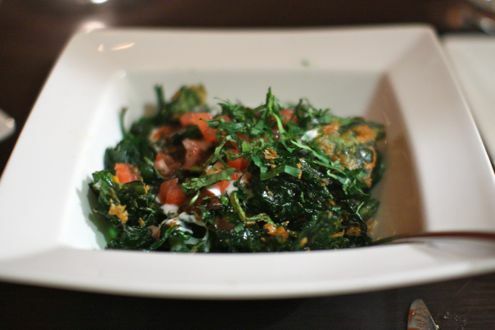 The following dish was one that has been previously covered on this blog and needs no further explanation, the Palak Chaat. Fine, it was amazing. As always. Just an essential D.C. dish. 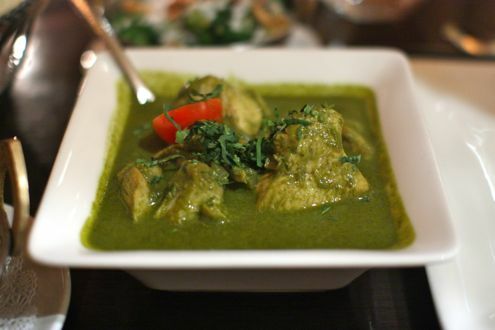 For our main course, we decided to be a little more adventurous and order the chicken green masala. Our waitress warned us that it was spicy, grading it a 7 out of 10 on the unofficial spice scale. While I’m a lover of all things spice, Rachel had some slight trepidation. Let me tell you, this dish is spicy! I would probably grade it an 8/10 myself in terms of spice, but unfortunately it was too much heat for Rachel. Having said that, I still really enjoyed it although I did need a few rehydration breaks (the champagne helped!). I sopped up the extra sauce with the garlic and truffle naan we ordered, too. 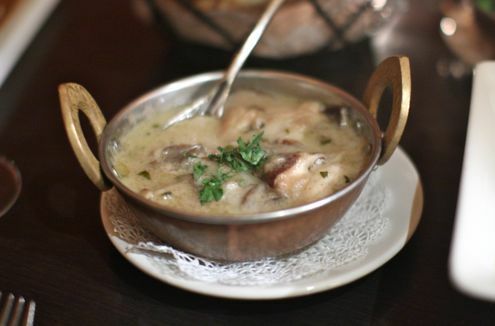 We also ordered sides of the broccoli cashew nut poriyal and wild mushroom korma. The latter was very rich but helped balance the spice of the green chicken masala thanks in part to the coconut milk base. 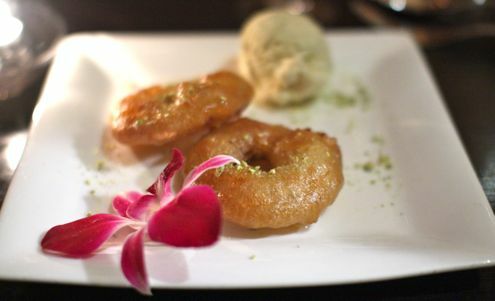 For dessert, we opted for Rasika’s bestselling dessert, the apple jalebi. 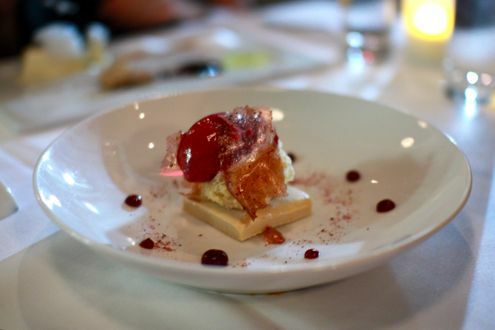 Basically an Indian beignet, it’s the cardamom ice cream that’s the real star of the show. 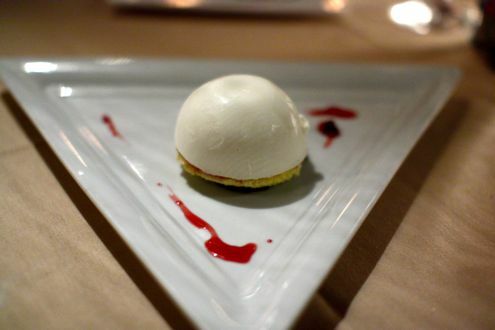 They also threw in a complimentary dessert to celebrate our anniversary which was another nice touch. There’s a reason why Rasika is continuously rated as one of the best restaurants in the District year in and year out: the food is consistently exceptional. 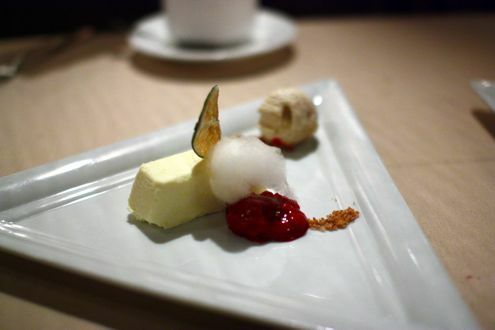 This is probably the fourth or fifth time we have dined at Rasika and after each visit we are wowed by the cooking. It also helps that they not only take reservations, which makes it much easier for when we have to hire a babysitter, but that it is also very reasonably priced. Honestly, I would be happy rotating visits to Rasika, Red Hen, and the Corduroy bar whenever Rachel and I have a date night in D.C., because these are the places you know you’ll have a good, filling meal without spending an inordinate amount of money. I’ll just make a mental note that the green chicken masala is really, really spicy on our next visit. DMV Dining is introducing a new feature called Quick Bites where we profile a popular menu item from an area restaurant. It’s also an excuse to use grainy cell phone pics when Brett forgets to bring his (bulky) camera. Boss Shepherd’s has received a lofty amount of praise for being open less than two months. The Penn Quarter restaurant was recently featured in Tom Sietsema’s Fall Dining Guide in the Washington Post as the food critic gushed over Chef Jeremy Waybright’s exquisite fried chicken. It just so happened that Rachel and I were a few blocks away at Taste of DC a few weeks ago, and while walking back to the Metro, we noticed that Boss Shepherd’s was directly across the street from the annual food festival. Considering that we’re not downtown much these days, we had to take advantage of the situation. Despite the fact it was only 5pm, all the tables in the dining room were already reserved for the evening. Needless to say word travels fast in this city! No matter, we were able to procure a couple of seats at the bar. And despite sampling a variety of foods at Taste of DC, we were on a focused mission to try this fried chicken. And let me tell you, both Rachel and I agreed that it was the best fried chicken we have had in our nation’s capital. 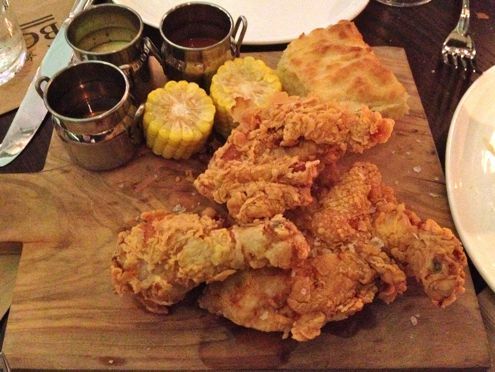 A wooden plank arrives at our table carrying a gorgeously fried half chicken that was brined in the kitchen for 12 hours. Incredibly crispy without being overly greasy, each bite of the delectably juicy chicken left a pair of smiles on our collective faces. 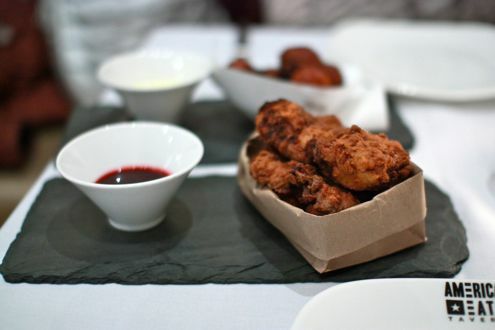 The bird is not only accompanied with a warm, flaky buttermilk biscuit, but a trio of dipping sauces – a housemade smoked egg yolk sauce, honey, and a housemade hot sauce, the latter of the three being my personal favorite. In addition, the platter also came with a pair of sweet corn cobs. But what’s truly amazing is that you really don’t need any of the sauces to enjoy this incredible chicken – that’s how good it is. For $24, it was a large enough entrée to split between the two of us resulting in a terrific early bird dinner (no pun intended). 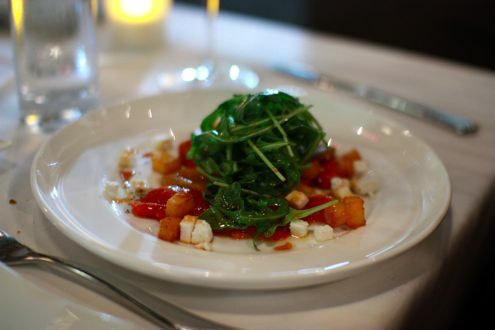 While I have only been to Fiola, chef Fabio Trabocchi’s Italian gem of a restaurant, just once, I was elated to find out that he would be opening a more casual, affordable venue within the same square mile of downtown Washington. 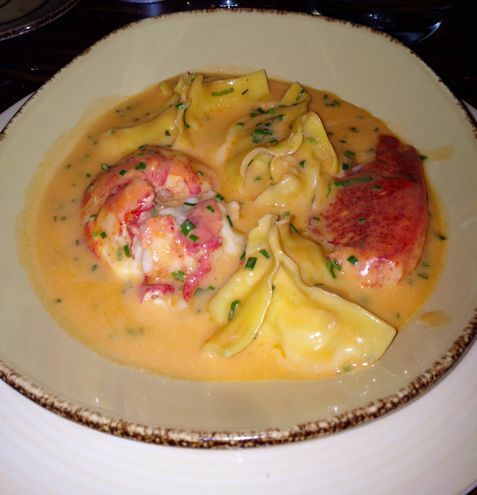 His trademark lobster ravioli remains one of my favorite dishes, but given the high price tag, I was hoping his sister establishment would be a little more reasonable for those just looking for a nice Italian dinner. When we arrived for our 8:30pm reservation, the bar was nearly two rows deep. Whether it was the Friday happy hour crowd or people simply waiting for a table, Casa Luca was incredibly busy. We weren’t even seated until almost half an hour later – not the best way to start the evening, but we had a glass of wine while we waited for our table to be ready. We started the meal off by ordering the Luca Antipasto Misto, a platter of prosciutto, pecorino fieno (sheep’s milk cheese), and a couple of small bites. The heirloom beets, which featured stracciatella and walnut pesto, as well as the lentil salad were well-received by our party of five. And while we enjoyed the thin-grilled crescia, having to pay $8 for a small amount of bread for the table was slightly off-putting. As for the pasta course, we decided to share three dishes amongst the five of us. 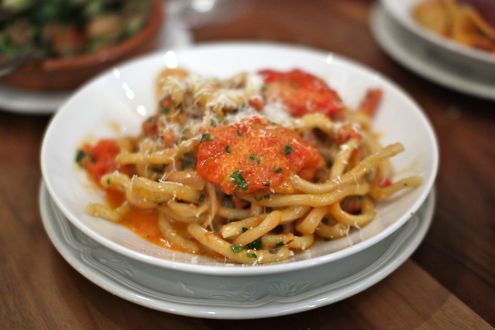 All housemade, the bucatini was prepared with guanciale, tomatoes, and pecorino. 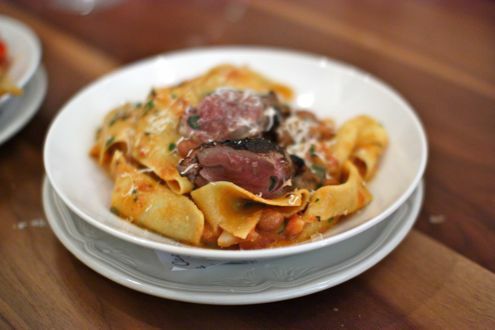 Meanwhile, the pappardelle was blended with Borlotti beans, rosemary, duck livers, and Parmigiano Reggiano – an interesting, if not slightly intimidating combination for those of us not a fan of all things liver, but thankfully it didn’t overwhelm the dish and made for an enjoyable pasta. My favorite pasta, however, was the smoked potato gnocchi. 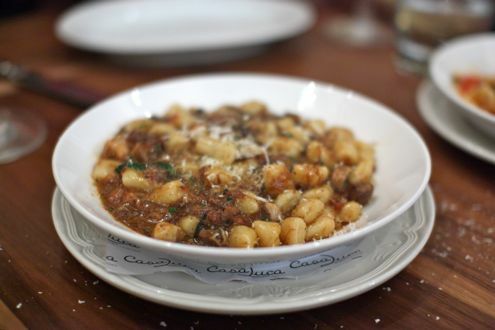 Engulfed in a hearty duck ragu with a smattering of Cremini mushrooms, the soft, pillowy gnocchi perfectly complemented the outstanding sauce. We also decided to split the Grigliata Mista di Pesce amongst the table, which was a heaping family-style platter of grilled seafood. 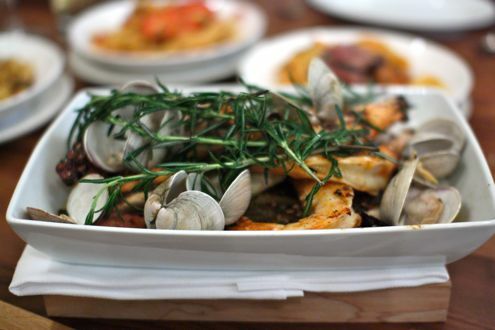 It included bronzino, calamari, prawns, clams, and scallops and made for a great sharing dish between our group. The fish was impeccably cooked while the grilled calamari was excellent. 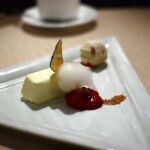 While the service was fine, my one qualm with Casa Luca was the prices. Given how expensive Fiola is, I had assumed that Casa Luca would be more affordable, but when looking at the menu, the majority of the pastas still cost over $20. And not only that, but the portions weren’t even that generous. In short, it turned out to be a more expensive meal than anticipated which was slightly disappointing. On the flipside, Casa Luca also offers 20 bottles of wine for $28, a very reasonable price that helps offset the cost of the otherwise expensive food menu. It was a very good restaurant, but if Casa Luca were to either slightly lower its prices or increase the portion of its dishes, I probably would have left dinner a little more satisfied. 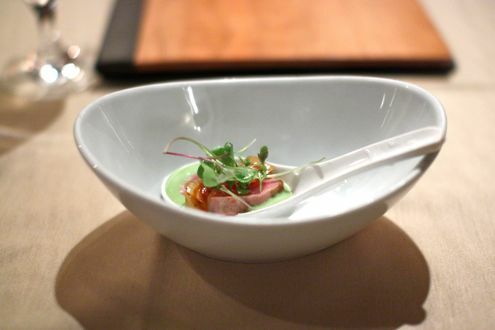 With our friends Keith and Casey, we ventured to the upstairs dining room where we were treated to an amuse bouche of chef Scott Drewno’s Chinese dough knot soup, which featured two crispy duck wontons swimming in a broth of duck stock, fava beans, and water chestnuts. I’m not one for hyperbole, but this was arguably one of the best wonton soups we have come across. The broth had a very robust flavor, and I wished that there were about 20 more wontons swimming in the broth after devouring the two that were in there. After some deliberation, the four of us decided to split four appetizers so we could share some of The Source’s “First Flavors” amongst the table. 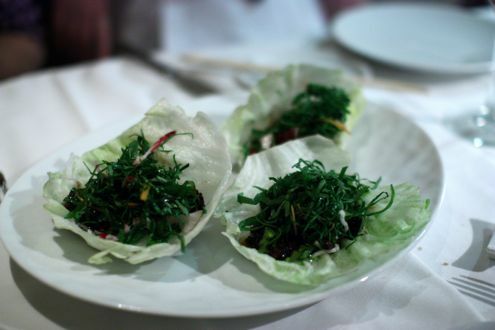 Up first was their Border Springs lamb lettuce cups. Blended with toasted pine nuts and rice sticks, these were not your typical P.F. Chang’s lettuce wraps. 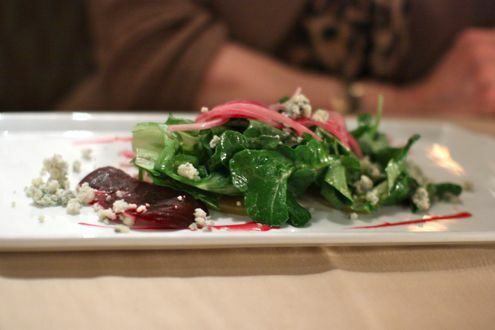 The lamb, locally sourced from the nearby Virginia farm, was wonderfully cooked while biting into the cool, crisp lettuce. 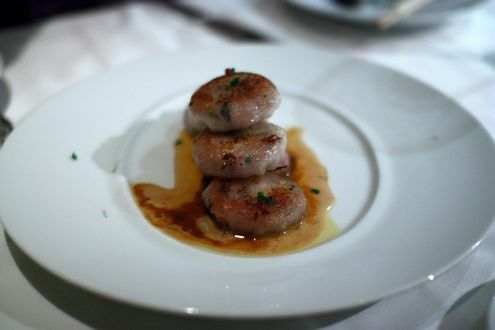 Up next was one of Chef Drewno’s classics, the crystal garlic chive dumplings. If there’s one dumplings dish at The Source you have to try, it’s this one. Stuffed with king crab and Kurobuta pork, this is as good as it gets. In fact, we’ve ordered it on every visit thus far. Speaking of dumplings, we also ordered a plate of their “Tiny Dumplings”. 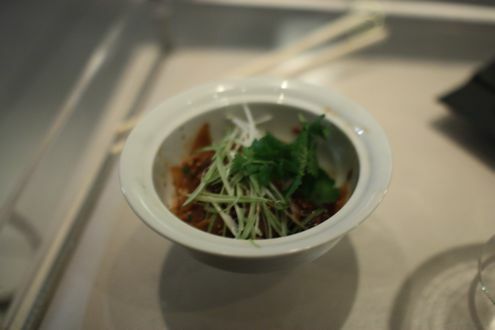 Good for sharing, the miniature dumplings were prepared with pork belly, black vinegar, chili oil, ginger, and topped with cilantro leaves. 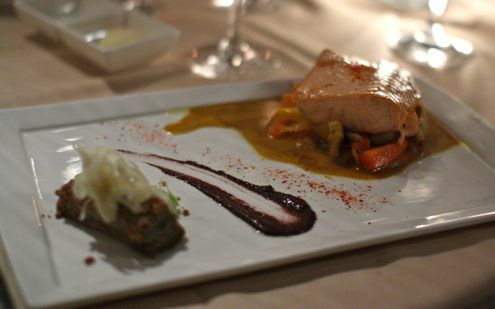 Finishing out the round of appetizers was the Tandoori arctic char. Sitting on a bed of cardamom raita, the fish was topped with pickled Japanese cucumbers. The arctic char was impeccably-cooked, and I especially enjoyed the crispy skin while the raita really complemented the fish. 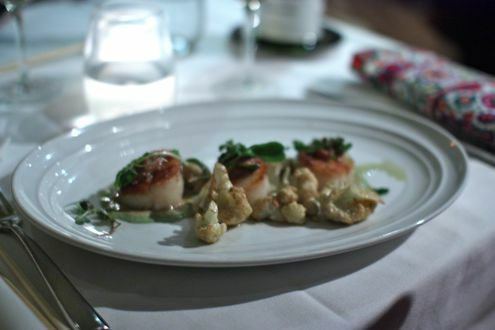 As for our entrees, Rachel got the day boat scallops, which were accompanied with cilantro raita, curried cauliflower puree, and rhubarb lime pickle. After so many appetizers and small dishes to start, she was glad her entree was on the lighter side and wasn’t too heavy. She only wished she maybe picked a different dish since the flavors were similar to the arctic char appetizer and didn’t seem as unique as some of the other entrees that were chosen amongst our party of four. 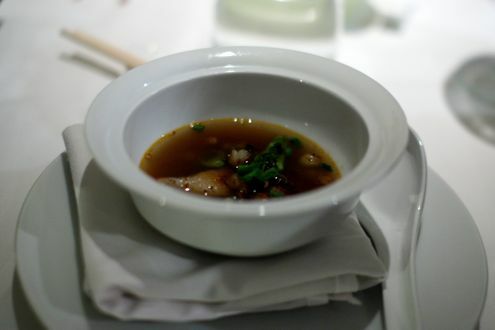 Meanwhile, I went with one of The Source’s trademark dishes, the lacquered Chinese ducking. 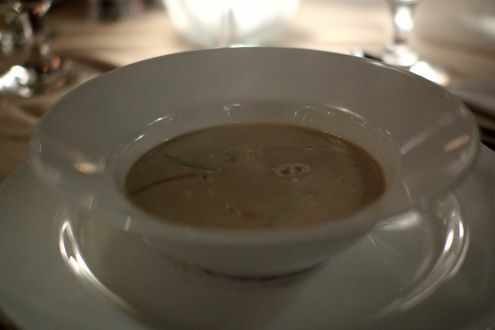 Chef Drewno’s outstanding rendition of the classic Peking duck recipe made this meal one to remember. 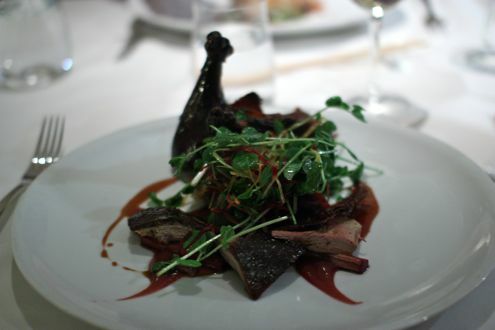 I have never come across duck that was so tender and flavorful. Throw in the crispy skin, housemade lo mein, and star anise-plum wine reduction, and you have yourselves one stellar entrée. In fact, the table reached a consensus that I had ordered the best plate of the evening, so that’s saying something. In other words: order it. Once again, we left The Source full and content. 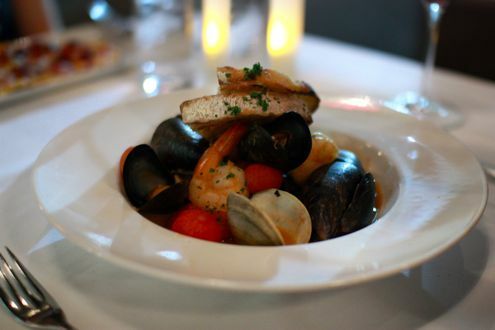 After three visits, the restaurant has impressed us each and every time. The service was excellent as always, but it’s Drewno’s cooking that keeps us coming back for more. Well done, chef. A few weeks ago, we decided to take a staycation and have some fun in our fair city of DC. We had been curious to try America Eats Tavern since it first opened and thought it would be fun to see the corresponding exhibit at the National Archives that was about to close. Additionally, we had a gift card to use for any ThinkFoodGroup restaurant, so we figured what better way to spend it than at Mr. Andres’ newest establishment (trust me, we tried calling Minibar… no dice). Anyway, after a rainy afternoon at the Archives, we made our way over to the restaurant. We got there just in time for their happy hour, which is great and kind of a hidden secret. 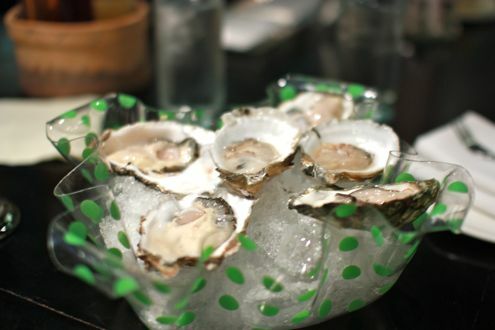 The Thomas Downing Oyster and Cocktail Hour runs from 4 to 6 p.m. and then again from 9 to close. Of course, we had to try their oysters so we started off with half a dozen and then ordered some more because they were that good, and a steal at a dollar apiece. 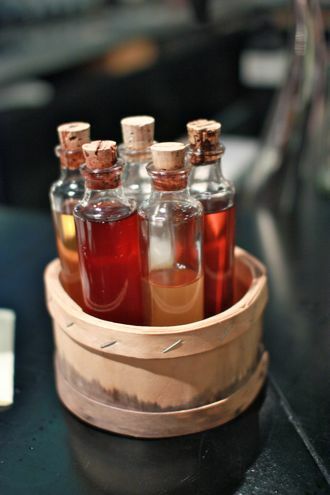 What makes their oyster hour really fun is their house made vinegars. Between the two of us we tried the pear vinegar, the sparkling wine, the pear and raspberry, the red wine, and the lemon. It was nice to mix and match the vinegars with the different types of oysters and see which paired well together. Their cocktail list looked awesome, but we couldn’t resist Great Lakes Edmund Fitzgerald on tap for $4. That’s just too good to pass up. Moving on, we were seated upstairs for dinner in their more formal dining room. We didn’t realize till we got there that there were two different menus. 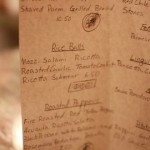 The downstairs menu was more casual and had more sandwich options while the upstairs menu featured more entrees. Upstairs we went, even though based on what we ordered, we could have sat anywhere. 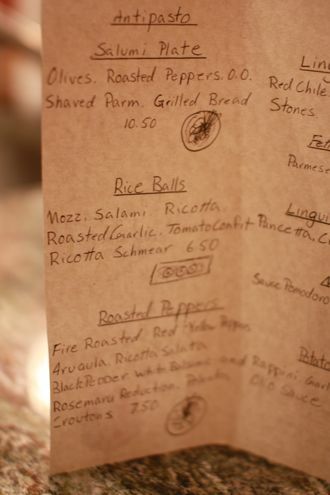 The menu itself had an incredible amount of detail in that each item came with a story of the origin of the dish. 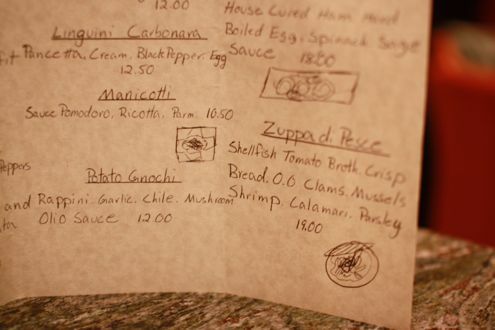 I have to say what makes the menu confusing is that many of the entrée items are only available on certain days of the week, so you need to pay attention to see if what you are in the mood for is available. Looking at the options, we were definitely drawn to many of the appetizers over the entrees, so we decided to start with a few of those and go from there. The first two appetizers we tried were the hushpuppies with housemade sorghum butter and the fried chicken with catsup. I have to say, I’m not sure which I loved more. 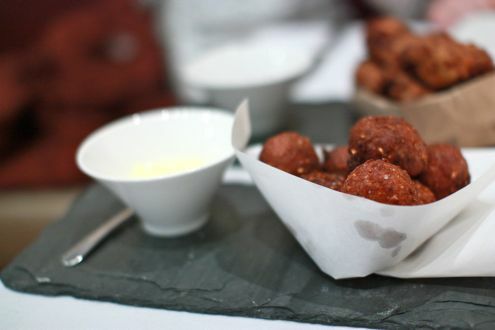 One of my favorite bar snacks I had in 2011 were the hush puppies at Food Wine and Co., and these blew them away. They were warm, buttery, and somehow incredibly light and crispy. They tasted even better when dipped in the corn butter that accompanied it. The fried chicken could have been a meal in itself, if only we could have ordered a larger portion. The chicken had a nice crispy crust along with incredibly tender and juicy meat. 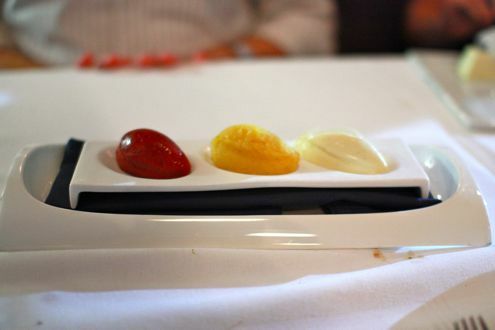 What was different was the blackberry catsup that came with the dish. Apparently catsups back in the 1800s were much thinner, more vinegary, and came in a variety of flavors before Heinz standardized it. They have several to choose from off the menu, but we were very happy with the blackberry mixture. Next up was vermicelli prepared like pudding, a dish I had read about which proclaimed it as basically a fancy version of mac and cheese. It had a nice crispy crust and was tasty, but it was almost too small to really enjoy and was probably the least memorable dish we tried. Finally, we decided to continue with the appetizer trend and got the peanut butter and jelly sandwich. We had heard so much about this from various reviews complaining how something so simple could cost $8 (I think it used to be $10 but they lowered the price). But yeah, it really is just a peanut butter and jelly sandwich. You could add foie gras to it if you want (for double the price), though just imagining the combination of PB&J plus liver doesn’t seem too appealing. The only difference was that everything was housemade. They even cut the crusts off like mom did, and it came with a small glass of milk with a straw. They definitely got points for presentation with that. It was a tasty sandwich, but the peanut butter overpowered the jelly a little too much. 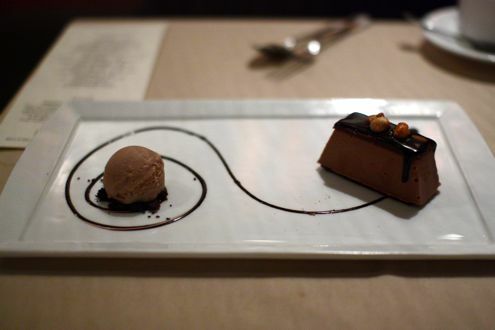 After all these fun apps, we were pretty full and decided to go straight to dessert. In the end we chose the pineapple upside cake, which was warm and delicious, and I guess pretty fitting since Dole is a sponsor of the restaurant. Although we had never been to Cafe Atlántico before, we definitely love what they did to decorate the place for America Eats. It really does mirror the exhibit that ran at the Archives and the restaurant itself looks like something out of a museum, filled with historic pictures and artifacts and decorated in red, white and blue colors. 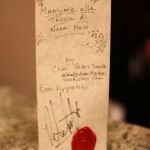 As a final touch, they presented our check inside a book. I definitely appreciate when restaurants get creative with the check presentation. There’s still time to check out America Eats if you haven’t yet. They were supposed to only be open until January 4th but we were told they extended their run through July of this year. While the food we tried didn’t blow me away, it was definitely fun and felt like a history lesson at the same time. I would go back and maybe share some entrees too, or see what their brunch is like. 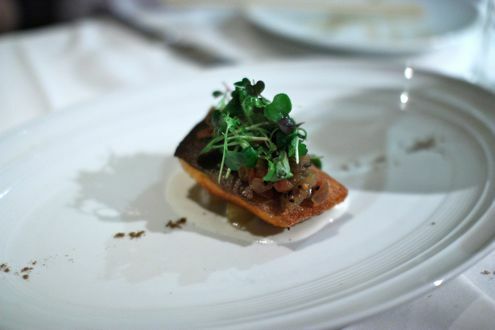 Who knows what Jose Andres will decide to do come this July? A few weeks ago, I went out to dinner for a girls’ night with a bunch of my close friends in DC. We weren’t celebrating any special occasion, but it had been awhile since all of us were together and we decided to have a fun night out at Fiola, one of the newer and more acclaimed restaurants to open this year. 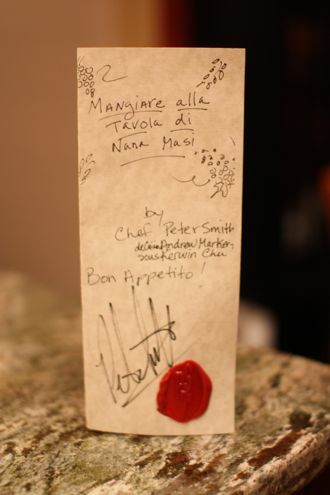 While I had never been to Fabio Trabocchi’s original restaurant, Maestro, I have always heard great things about his food and reputation, and I was very excited to try his new venue that has been receiving rave reviews all year. We knew this meal would put a dent in our wallets, but we were ready for a fun and memorable evening. First things first, we had to find Fiola! A word to the wise: while the address says Pennsylvania Avenue, it actually leads you to the back of the restaurant. Turns out that you need to go around to Indiana Avenue to come across the entrance. Tricky, indeed. Once we all gathered and had some cocktails, we were seated to our table. I had heard that Jeff Faile’s cocktails weren’t to be missed, so I ordered a Milan Mule, which was his take on a Moscow Mule but was concocted with Plymouth gin, Amaro Abano, lime juice, and Blenheim ginger ale. There were seven of us, so we split two bottles of tasty prosseco throughout the meal. The first item brought to our table was their incredible homemade rolls. These were more like buttery croissants or brioche buns as opposed to traditional rolls, and they were a great indication of what was to time. I swear I would go back to Fiola in a heartbeat just for these rolls alone. We split two appetizers for the table and were very happy with both. 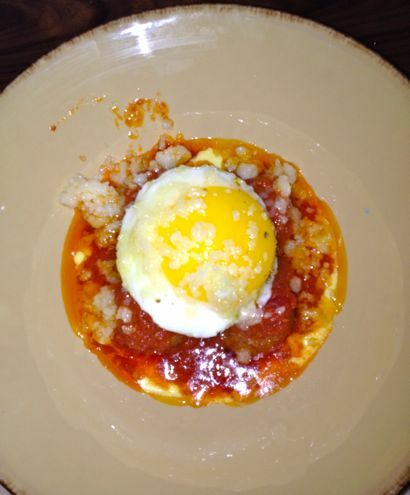 First up were the Fiola meatballs, topped with a sunny side up egg and Pecorino Toscano. I’m starting to learn that everything tastes better with a runny egg on it, and these were no exception. The meatballs were wonderful and the sauce was irresistible. The bread we had wasn’t the best for dipping, but we made sure there was nothing left in the bowl. Next up was one of the restaurant’s daily specials. 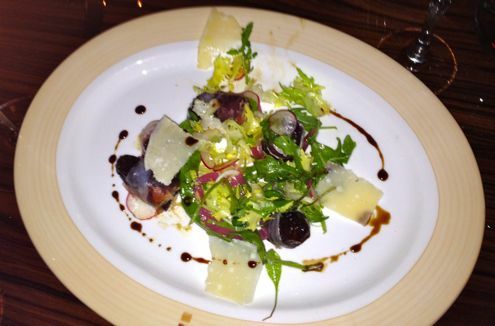 If they are offering it, do not hesitate to order the dates stuffed with fois gras wrapped in prosciutto and served with generous shavings of Parmesan and drizzled with balsamic. There were only a few dates, so we cut them up for everyone to try. It might not have been the best way to sample it as it is meant to be a singular burst of flavor, but I still savored each bite. There were so many appealing entrees to choose from that it was hard to make a decision, especially since you can order most fresh pastas as half portions if you are torn between pasta and something else. In the end, I knew I had to get Fabio’s signature dish that was a carryover from Maestro, and that would be the lobster ravioli. It just sounded too good to pass up, and I definitely wasn’t disappointed. The waiter informed me that the dish consists of one and a half pounds of lobster in total, and I believed him once it was placed in front of me. In the dish were giant chunks of lobster claw and tail sitting in a lobster broth, not to mention even more chunks of lobster stuffed inside the ravioli, which more closely resembled thin wontons. 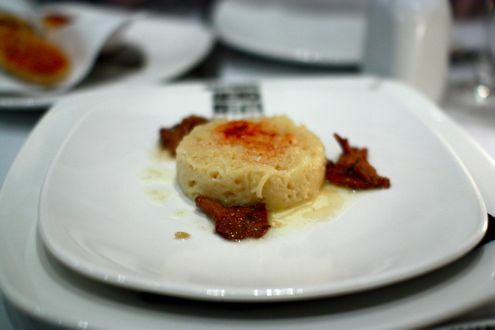 I loved the delicate pasta with the meat inside as opposed to the commonly found version of pureed lobster with cheese. The lobster itself was infused with ginger and the sauce was creamy but somehow not heavy at all. I was in heaven. I don’t think I’ll order it if I come back, only because there are so many other appealing dishes on the menu that I want to try. We were completely stuffed at this point, but we wanted to try at least one dessert to see what they were like, so we ordered the Bombolini. 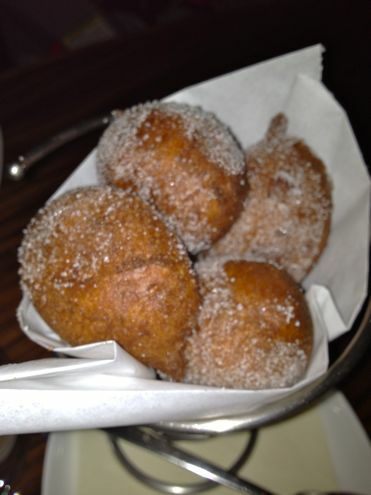 The dolce comprised of donuts filled with ricotta and were topped with powdered sugar. 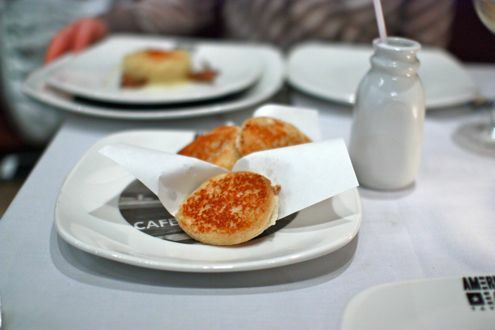 There was also marmalade and gelato to dip the donuts in, and they were great fluffy bites to share amongst the table. 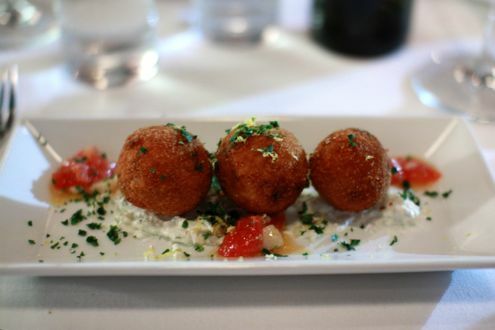 They reminded me of the zeppoles from Graffiato, and I have to admit, I think these were even better. With the bill came more sweets, including a tiny macaron and a piece of chocolate with cream inside. I always love when restaurants give an extra treat to send us home. I should also mention just how wonderful the service was. We were a large party with a baby and stroller and they were definitely accommodating to us. When our entrees came, a few of them seemed to be more room temperature as opposed to hot, and when we said something, the waiter quickly took them away and brought up fresh dishes for us within minutes. While some of us were waiting for our dishes to come back, he even poured some extra prosecco into our glasses to make up for the delay. We certainly appreciated the gesture. Overall, we were all very full and content when we left the restaurant. Fiola is certainly not somewhere I would go on a regular basis as it was certainly an expensive meal, but everything tasted like it was prepared with great care and simply tasted of a higher caliber. I was definitely eying some of my friends’ dishes, like the homemade lasagna, the short ribs, arctic char, bucatini, gnocchi, and scallops. I should note that Fiola also has a “Presto!” lunch special where you have your choice of entrée and a beverage for only $15. 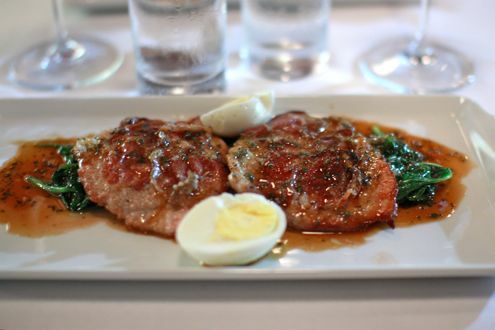 There are only half a dozen entrees to choose from, but it’s a great way to try Fiola without breaking the bank. There’s also a happy hour from 4pm to 6pm that features $6 cocktails and glasses of prosecco. 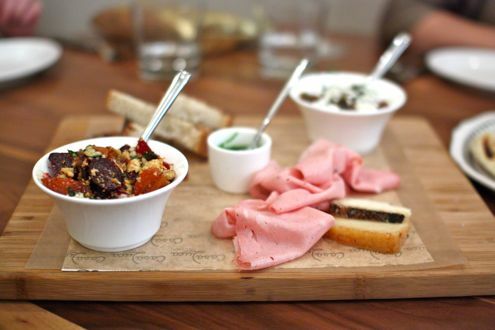 So whether you go for lunch, happy hour, or dinner, do not miss out on Fiola. I’m sure glad I didn’t. Prior to the Brightest Young Things Night at the Newseum party last Saturday, us and a few our friends went to the adjacent Source for a few appetizers and drinks. Rachel and I have been meaning to go to The Source for awhile now, so we felt by checking out the bar portion of the restaurant that it would give us a preview of what a full meal in the dining room would be like. We found a table in the lounge portion of Wolfgang Puck’s Asian fusion venue which features a Japanese Izakaya-style menu. The five of us started the evening off with some cocktails, and after glancing over the menu, I went with The Hemingway. A concoction of rum and grapefruit, I’m not sure what was stronger: the actual drink or the gargantuan slice of grapefruit that was atop the rim of the martini glass. As for food, our group decided to split two orders of the Kobe beef sliders. Arguably the circumference of a half dollar, The Source instantly reminds you that the “small portion for high price” mantra is alive and well. Each order only came with two, and for $8 per dish, we were hoping that these would meet expectations at the very least. Thankfully, they did. 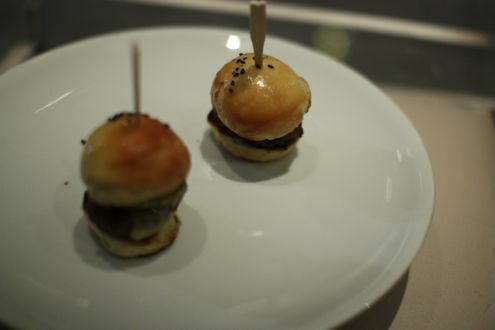 Prepared with onion marmalade and sandwiched between miniature brioche buns, the quality of the beef was excellent. Were they that delicious enough to justify the $8 price tag? Maybe if they had thrown one more on there. 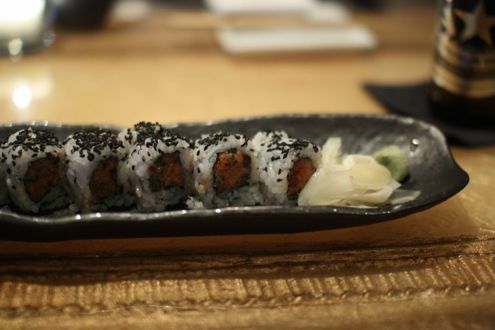 Up next was the spicy tuna roll, and it was simply wonderful. Eight pieces of fresh cut tuna topped with aioli really gave us a glimpse inside the Asian-inspired kitchen of The Source. And while it was priced at an exorbitant $13, you get what you pay for. 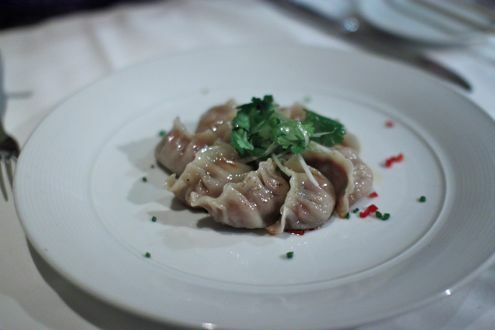 Our final dish was the Sichuan chicken dumplings, and once again, The Source did not disappoint. The wrapping was delicate while the chili “dan dan” gave each of the five dumplings a healthy amount of heat. Overall, we had a fun if not expensive pre-party meal at The Source. 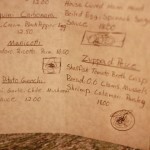 For a handful of drinks and only four orders of food, our bill came out to well over $100. 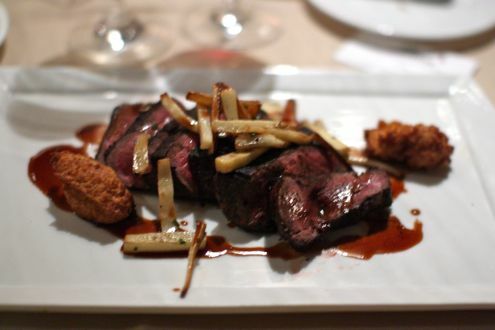 You’re probably better off having dinner in the main dining room than grabbing a bite in the lounge if you want to justify your expenses as well as leave the restaurant with a full stomach. Thank goodness the Newseum cafeteria was open during the party. Who knew an order of chicken fingers could be so filling? The Source is located at 575 Pennsylvania Ave NW in the Penn Quarter neighborhood of Washington, DC. Before meeting a group for dinner at Carmine’s, we went across the street to Sei Restaurant & Lounge for happy hour. 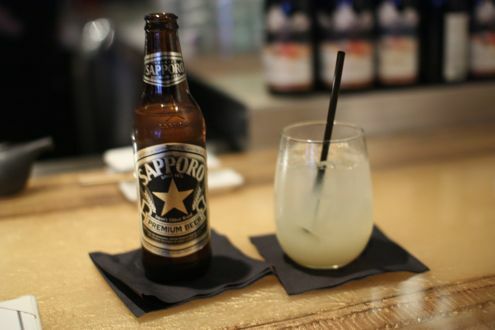 The restaurant offers specials at the bar Monday through Friday from 5pm to 8pm, making it one of the longer happy hours available in DC. Considering it is difficult to get down to the Penn Quarter area before 6pm most evenings, Sei was very appealing. We ordered drinks right away and I got the Asian Pear Sangria while Brett ordered a Sapporo. Although we were about to head to Carmine’s for a big dinner, Brett was a little hungry so we ordered the to tie us over. 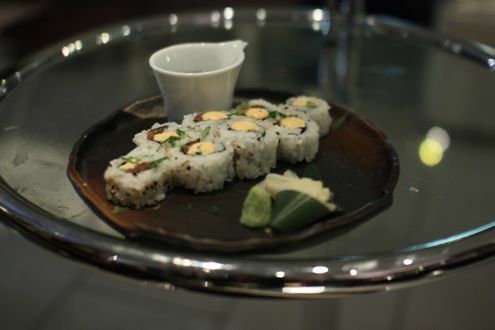 I had one of the rolls and can say that they were incredibly fresh and had a nice kick to them. 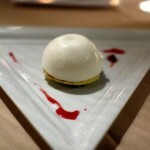 We have been to Sei for happy hour several times now, and I definitely want to go back at some point soon for dinner. We then headed to Carmine’s and somehow managed to order the perfect amount of food for 14 people. This was a dinner through a group at our synagogue, and I volunteered to help plan the event. We had to find a place that could easily host large parties, but didn’t want to worry about itemizing everything on the bill. Carmine’s was a no-brainer in that sense. We split the costs for the family style meal, and then everyone added in what they owed for drinks. Somehow, each person only owed $18, and that included tax and tip (at least for the food bill)! We all shared Caesar salad, mixed greens, eggplant parmesan, chicken marsala, Penne alla Vodka, spaghetti and meatballs, spinach, and broccoli. Everything was delicious, and we both agreed that some of the dishes even tasted better compared to our first visit a few months ago. The spaghetti and meatballs was a proven hit, and everyone really loved the eggplant parmesan and chicken marsala. 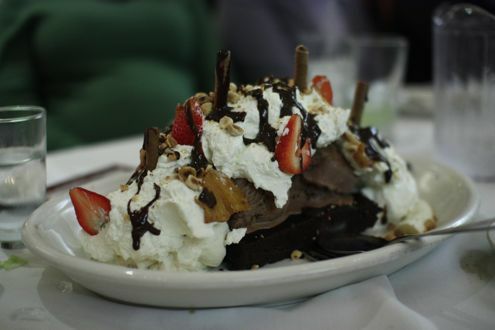 We definitely didn’t need dessert, but decided to go big or go home, and ordered the monstrous Titanic. Yes, it’s called that for a reason. Think of it as a colossal banana split sundae, complete with fudge brownie, countless scoops of vanilla ice cream, chocolate syrup, and of course, whipped cream. We all attacked the sundae and then cried mercy. 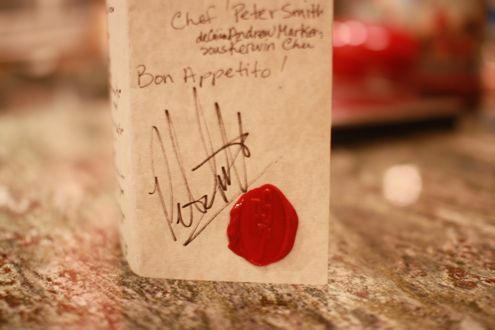 The evening turned out to be a fun time with good food, great conversation, and all at an incredibly affordable price.